In August 2015 the new p2p lending marketplace Finbee launched in Lithuania. Finbee finances small unsecured consumer loans. The CEO told me that they meet all borrowers in person and that these are mostly looking to refinance other debts at higher rates, which they have paid in accordance to schedules punctually over months or years. Typical interest rates for investors are in the range of 20% to 32%. The platform is still very young, but recently loan volume picked up and Finbee crossed the milestone of 1M Euro loans financed since launch. I started small and deposited only 50 Euro right after launch to test it and gain first hand experiences. Only two months ago I started depositing more and right now my deposited total amount is about 1,550 Euro. 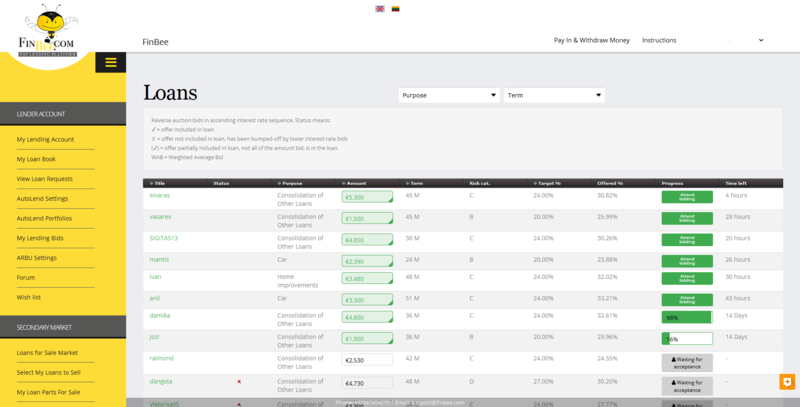 Finbee lists all loan request and investors can bid either manually or via autoinvest (autolend). There is an auction period for each loan with investors underbidding each others in an reverse auction, meaning the interest rate will sink once the loan is filled. A pecularity of Finbee is, that each investor with a winning bid gets the individual interest rate he made the bid on, meaning there is no uniform lending rate for investors in the same loan (this is different from the way most other platforms handle reverse auctions, where usually all investors with winning bids get the same rate which is set at the highest winning rate at auction closing). Loan requests at Finbee. The ones with the green button at right are open for bidding. Auction periods are initially set to 14 days but then reduced to 48 hours, once the loan is 100% filled by bids. This auction mechanism often causes a mad rush in the last 5 minutes. Lots of bids are made right before closing and it is usual that the top closing interest rate drops 3-5% in these last minutes. This is aided by a mechanism abbreviated ‘ARBU’ (Automated Response to Bumbed-off Underbids). Investors can enable ARBU to make lower bids on their behalf, once their original bid is outbid. The mechanism is quite configurable in selectable settings, but the catch is that it will not make more than 5 lower bids per loan. This led me to do quite a bid of configuring and experimenting with my settings. I also changed my strategy from multiple smaller bids on the same loan (e.g. 5 bids at 20 Euro), to now just 1 or 2 bids per loan at 30 to 35 Euro. In the first months I have just observed what is happening on the Finbee marketplace. Since February I go for the riskiest loans, risk category ‘D’ and sometimes ‘C’ with the highest loan amounts and the highest interest rates. I do all bids manually and have ARBU enabled with my settings, which I tweaked quite a bit. If I have multiple successful bids in one loan I try to sell some of the loan parts on the secondary market at premium in order to reduce the concentration. On the secondary market only current loans, that have made at least one repayment, can be sold. I also try to sell my late loans on the secondary market, but that means I have to wait for them to turn current again before I can sell them. The platform is stable and generally the user interface is good to use. Finbee is built on technology supplied by Madiston in the UK, and so far I have not encountered any bugs (unlike other platforms!). One thing that could be improved is the navigation in the secondary market. Especially as a buyer it is not efficient to locate interesting offers. But since I only use the market as a seller, that hasn’t bothered me. According to Finbee there have been no defaults so far. I had a few lates, but they mostly turned current again. At the moment I have two late loans, one of which is just a few day overdue. The average interest rate of my loan parts is 31%. My way to use Finbee is a bit time consuming, but that is due to manual bidding. 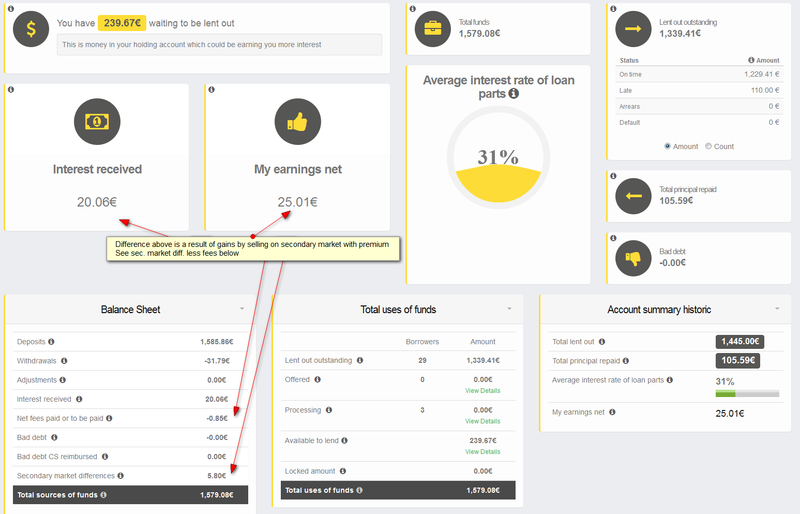 Using autoinvest would save time, but result in about 5-6% lower interest rates achieved, so for the time being I rather watch closely what is happening and try to optimise my yield. So far I sold 10 loan parts at premiums between 3% and 10% on the secondary market, which boosts my results even after the 1% seller fee. In the current environment I could probably sell all my loan parts at 4-5% premium if I wanted to. the loans I invested in have terms of up to 60 months – of course it is much too early to draw any conclusions. I fully expect to see defaults happen and it will be interesting to see if all can be covered by the compensation fund Finbee maintains. I expect that mid-term interest rates will sink as investor demand is rising. For small loans the weighted average rate at auction close is already occasionally dropping in the low teens or even below that. My Finbee portfolio. Absolute interest earned is low, since I had deposited only 50 Euro until February and topped it up later. I agree that on Finbee there are no bugs so far like on other Platforms. I like also the transparency and the statistic page on Finbee. I invest in the most riskier loans and have now 10% overdue loans in my Portfolio. It seems that the default rate is low at Finbee but I fear that the overdue loans were more with the time and I cant get them out of my Portfolio. And I dont want to trust a collection company. If I could sell overdue and default loans on the secondary market I would double my investment on Finbee in the long run. All in all Finbee is at the moment one of my favourite Platforms. Thanks very much for this. I have signed up and started lending (just dipping my toe in for now) based on your experience so far. I have also used TransferWise to send euros as I am UK based but there is also the issue of bringing funds back to the UK from FinBee as I imagine this would incur various fees. Would it be best to use a dedicated Forex account to do this, do you know? I am based in the Eurozone, therefore for Finbee I have not used Transferwise. But I have used it with other platforms and some allow it to be used both ways, that is for deposits AND withdrawals. Thanks for this Wiseclerk. When I looked into how to receive money through TransferWise, I thought their method would not work for FinBee as it essentially means sending FinBee a special weblink in order to receive monies I believe. nice article, but can you tell if the loans are secured or what happens if the loan is in overdue and the loaner doesn’t pay. Finbee tries to collect the debt. Once it is more than 60 days overdue, investor are entitled to repayments from a compensation fund, that Finbee maintains – provided there is enough capital in the fund to cover the debt. Yes, got that message for a few hours. Then it was fixed.